The Assignment: Play something melodic atop two variations. Deadline: This project’s deadline is Monday, October 1, 2018, at 11:59pm (that is, just before midnight) wherever you are on. It was posted in the early evening, California time, on Thursday, September 27, 2018. Step 2: Come up with a melody, and then come up with means to create variations on it. Think of the variations as permutations of the melody. Try to have the variations not veer too far from the original. As you develop the variations, think about relative balance between the three layers. Step 3: Record a short piece of music in which the three layers are stacked atop each other. You might perform the layers separately and then combine them, or you might have a means for them to play simultaneously. You might have the balance between the tracks remain static throughout, or you may change relative volume at times. 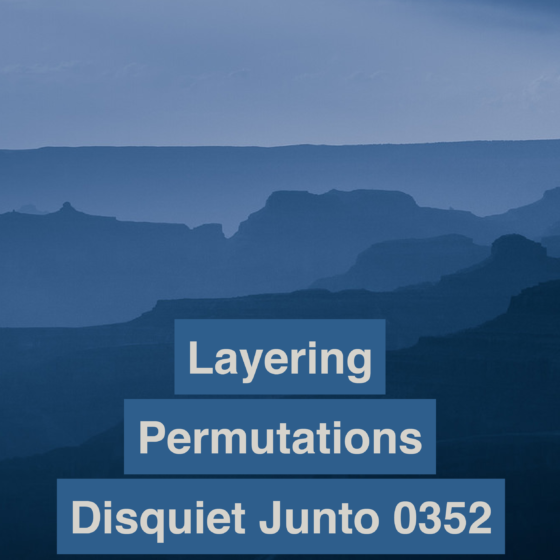 Step 1: Include “disquiet0352” (no spaces or quotation marks) in the name of your track. Step 2: If your audio-hosting platform allows for tags, be sure to also include the project tag “disquiet0352” (no spaces or quotation marks). If you’re posting on SoundCloud in particular, this is essential to subsequent location of tracks for the creation a project playlist. Title/Tag: When posting your track, please include “disquiet0352” in the title of the track, and where applicable (on SoundCloud, for example) as a tag.